We’ve tackled the yogurt button on the Instant Pot. And guess what? It’s actually not so bad! 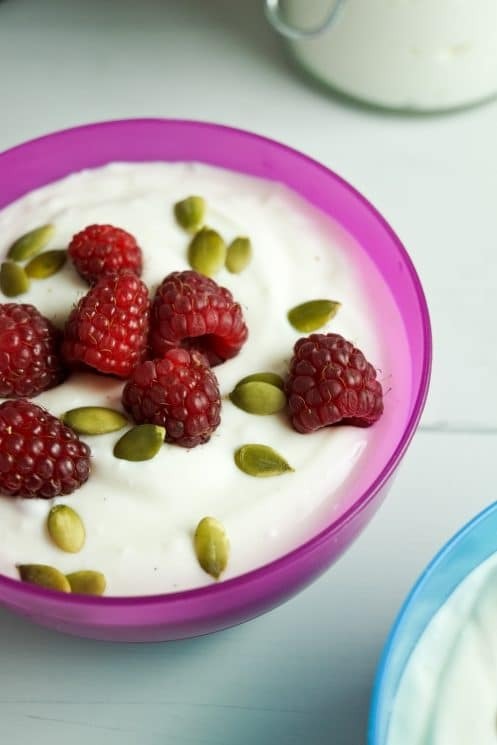 Just two ingredients, a bit of time, and a thermometer are all you’ll need to make the tastiest and most economical yogurt you’ve ever had. 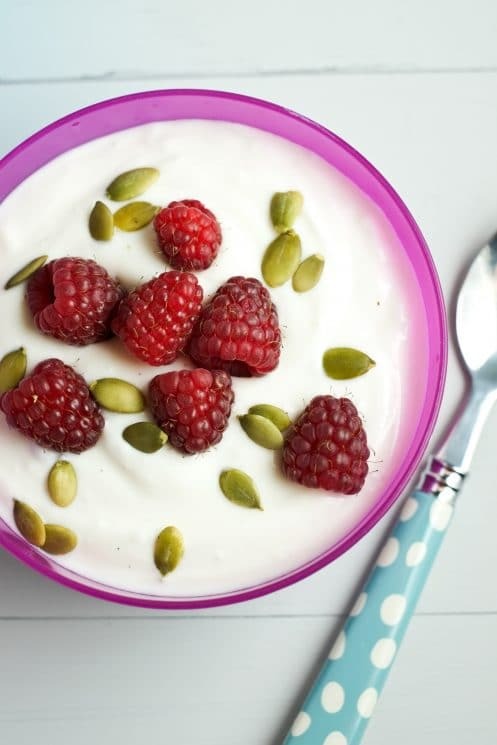 Here’s the skinny on how to make yogurt in an Instant Pot. Of all the buttons on the Instant Pot, “Yogurt” seemed the most formidable. Unlike many of the others, it doesn’t seem intuitive. So, with some research and experimentation I bring to you a step-by-step guide to making your own yogurt. Before we get into the details, I’ll just outline how the process works. 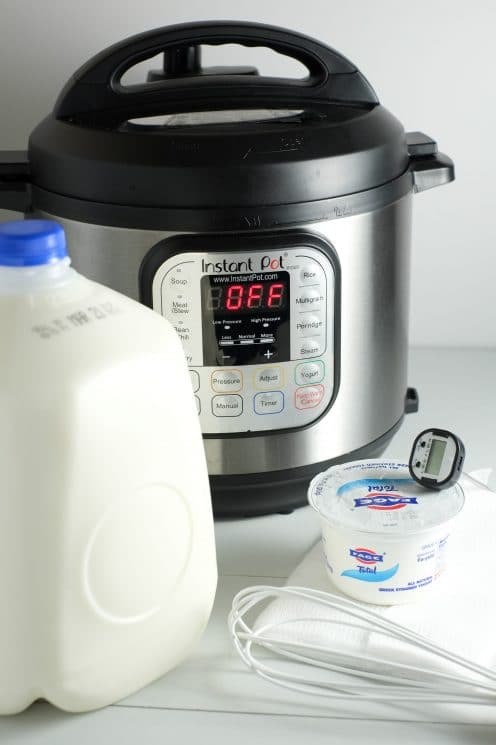 You warm up milk in the Instant Pot, then cool it to a certain temperature. Next, you add a little bit of yogurt as “starter,” and heat again – this time for about 8 hours. That’s it! And if you want Greek yogurt, you strain it using cheese cloth for a couple hours. I know that sounds like it takes forever, but really it’s hands off for all but a few small steps. And it’s so worth it! I love how it tastes because it’s not as sour as so many I’ve purchased. Though, if you do like it sour you can cook it for 10 hours instead of 8 and it’ll get more tangy. So great to be able to customize your own yogurt! Pour a gallon of milk into your very clean Instant Pot. Push the “Yogurt” button and press the “Adjust” button until the screen says “boil.” Now close the lid (vent open or closed – it doesn’t matter) and walk away. This will heat the milk to a boil and then beep when it’s done. It takes about an hour. A note on milk: I used 2%, but I have read lots of recipes and it seems you can use anything from 1% to whole and have success! Once the boiling is finished, use a thermometer to make sure the milk has reached 180* F. Mix the pot just a little to make sure the milk is even in temperature so you don’t get a false reading. If the milk isn’t quite to 180* F, you can use the Saute function on low to bring the milk to temperature. Just make sure to stir regularly so it doesn’t scald, and then turn it off as soon as it reaches temperature. After reaching temperature, it’s time to cool the milk down again (does it feel like we’re running in circles?). We need it to get down to 110* F or a little under. This can be done by simply taking the pot insert out and setting it on a cooling rack on the counter. This takes an hour or so. NOTE: If you want to cool the milk more quickly, you can instead set the pot insert into a sink full of cold water. Stir the pot and swish the cold water in the sink around until the milk gets to temperature. This took me maybe 15 minutes, but it’ll depend on how cold the sink water is and if you make a whole batch or half. At 110* F or less, you can add your yogurt starter: any plain yogurt with live and active cultures works. I used Fage Total Greek yogurt (made with whole milk) but I my dad uses Chobani plain 0% and that also works well. You only need 3 tablespoons! Whisk well. NOTE: Metal whisks are rumored to leave a faint metal taste, so use a silicone one if you have one! Finally, place the insert pot back into the cooker and press “Yogurt” again. This time, adjust it until the screen reads 8:00. This means it will keep the yogurt at the perfect temperature for 8 hours so that the cultures can work their magic. You can also select 10:00 hours if you prefer a tangier yogurt. I like to make it so that this process happens overnight, but as long as it doesn’t finish in the middle of the night you’ll be okay. To strain the yogurt, you’ll need cheese cloth or something like it. Place the cheese cloth in double layer inside a large colander/strainer and set the colander in the sink. If you want to save the whey (the liquid that drains out), you’ll need to find a way to have it drip into a bowl. I placed a small bowl upside-down in a larger bowl for the colander to rest on. You can use the whey in some baking recipes. The straining time is up to you. I let mine drip for a little under two hours, but it could have gone longer. The longer you wait, the thicker it will be. Some people choose to strain for 3-4 hours if they like it really thick. Now, you can also add vanilla or sweetener. I made half of my batch into unsweetened vanilla yogurt by adding a tablespoon of vanilla extract and scraping the insides of half a vanilla bean. You could definitely use just the extract if you don’t have vanilla beans. 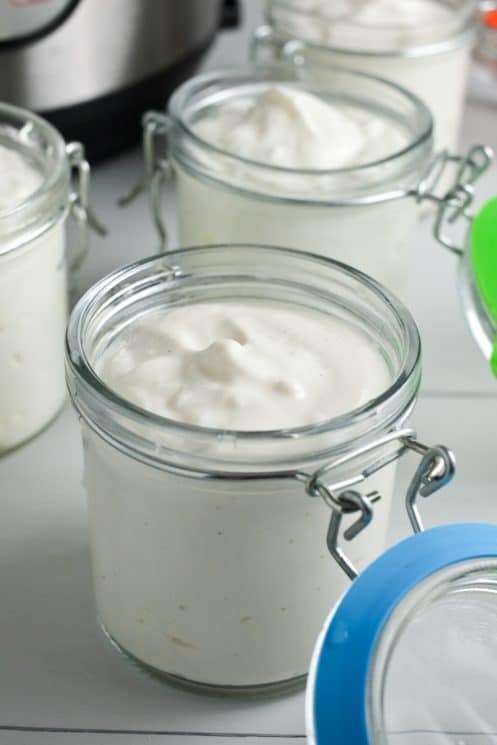 Oh – and don’t forget to reserve some plain yogurt to be the starter for your next batch! You can freeze it in ice cube trays and be all set for next time! I loved the experience of making my own yogurt! It is delicious and so much cheaper than buying. I got a ton and it only cost the amount of a gallon of milk and a single serving of Greek yogurt (and next time I won’t even need that!). 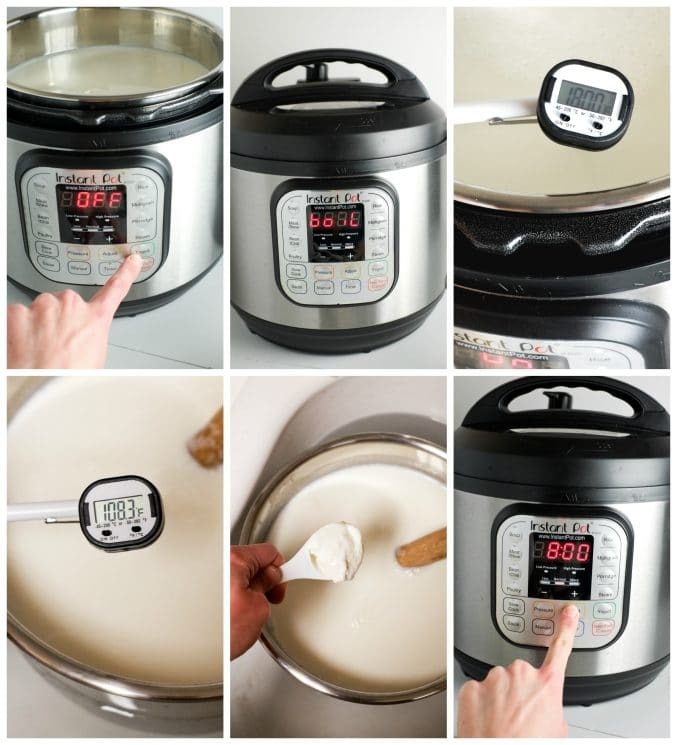 Pour 1 gallon of milk (1%, 2%, or whole) into the Instant Pot. Push “Yogurt” then “Adjust” until the screen reads “boil.” Place the lid on and walk away. It will heat the milk until boiling, and it takes about an hour. Once the boil cycle is finished and the pot beeps, give the milk a quick stir and then use a thermometer to read the temperature. You need the milk to have reached 180* F. If it has not, use the “Saute” function on low to heat the milk a bit more. Once 180* F has been reached, remove the pot insert and set it on the counter to cool to 110* F. This takes about an hour. A quicker option is to set the pot in a sink full of cold water and stir. This takes about 15 minutes. After reaching 110* or a little lower, add 3 tablespoons of plain yogurt. 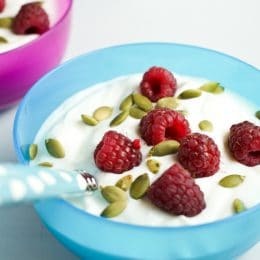 NOTE: make SURE the yogurt you use as starter contains live and active cultures! Whisk to mix the yogurt into the milk. Place the pot insert back into the Instant Pot and close the lid. Press the “Yogurt” button again and then “Adjust” until the screen reads “8:00.” This means the pot will incubate the yogurt for 8 hours, or you can choose “10:00” for a tangier yogurt. Once the incubation period completes, either refrigerate the yogurt as is, or make it into Greek yogurt. To make Greek yogurt: strain the yogurt using cheese cloth covering a large colander or strainer. Allow the yogurt to drip in the sink or over a bowl for 1-4 hours, depending on desired thickness. The longer the strain, the thicker the yogurt. Store yogurt in the fridge and it will be good for at least one week. 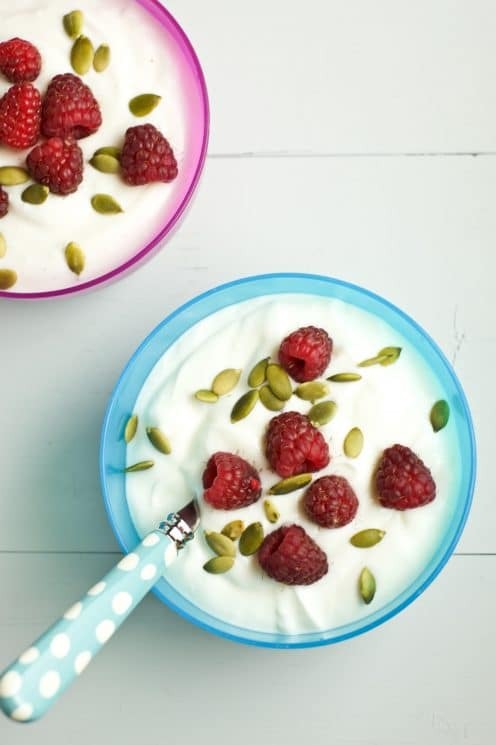 Don’t forget to reserve 3 tablespoons of yogurt to be your starter for next time! Freeze this in ice cube trays and you’re all set. 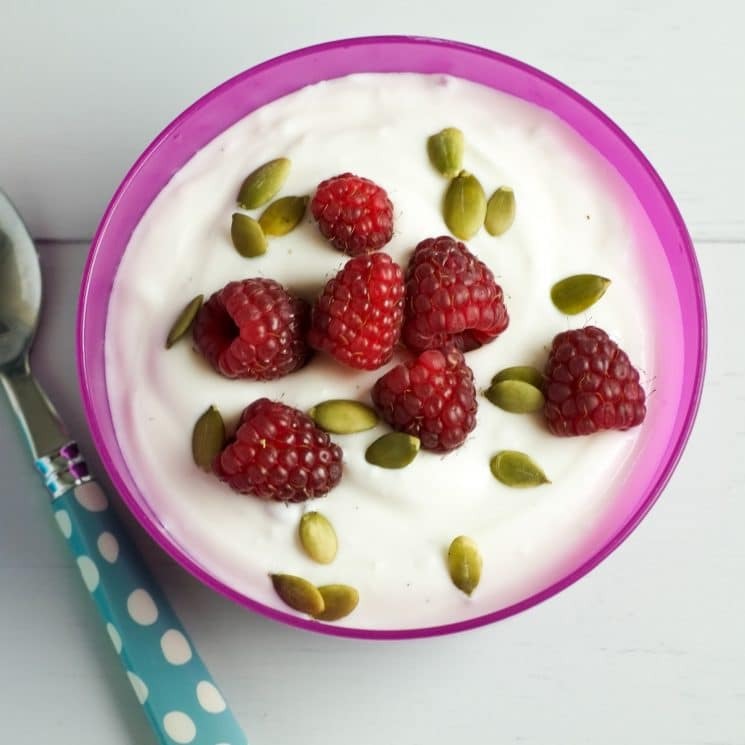 Thank you so much for sharing your step by step tutorial for making yogurt in the Instant Pot. I really seems like a lot of effort in the sense that you have to do something every hour until you get it set. I just bought one but haven’t opened it yet. Not sure it’s a time saver. You leave the yogurt set while the incubation process is going on. You’re not doing anything while the yogurt is incubating. I love making the yogurt like this. It’s simply set and go on with your day. Hi…just waiting for it to finish…can’t wait to taste homemade yogurt. It was very easy-thanks for sharing your recipe & tips! Just started a second batch! Everyone loved the first batch, and it disappeared quickly. How much Greek yogurt did you get from a gallon of milk? What do you store it in? We use FAGE and I’ve been intimidated to make my own. I do a half batch (half gallon of milk) strained quite well (thick) and it fits perfectly in a reused 32 ounce yogurt tub. I would be interested in the 1/2 batch instructions also. You mention a “half batch”. Does that mean everything is the same but use only 1/2 gallon of milk? Or are you dividing your full batch and making half Greek style and half vanilla? A full gallon is way too much for me. One gallon is too much for me. How do I make 2 cups of milk? Hi! Just tried this recipe. Question—when do I add vanilla and how much per batch?? Thank you!! Is the vent (valve) closed or open during the incubation period (in other words, is yogurt made under pressure or not)? Thanks! I made it with the vent closed and it turned out fine. In your experience how long does the yogurt keep in the fridge once it’s done? Thank you for posting this. I would love to try it, but my instant pot doesn’t have the yogurt setting. Do you know if there is another setting I could use in the IP-LUX? Hmmm – I’m not sure on that version. Sorry! Has anyone tried this with almond or coconut milk?? I have an instant pot that doesn’t have the yogurt button. Is there another setting on the older pot that works for yogurt? I JUST poured my milk in and noticed mine does not have Yogurt button also?!!!!!! Wonder what to do? Before my instant pot, I just heated my crock pot on low while making the batch. Once I poured it (heated and cooled milk with starter) from my stovetop pot into the crock pot, I immediately unplugged the crock pot and wrapped a big beach towel around the whole thing to keep warm. I let that sit overnight and by morning it was done. The crock pot was never on while the culture was growing. Just the fact that it’s warm and you have the lid tightly on should grow the culture nicely. We probably don’t even need to set it to anything. Definitely have Live culture. I use organic with raw milk. I have made MANY gallons of yogurt this way. The trick is not to put too much starter in, or it won’t have to work hard to culture and will be runny. Experiment. Good luck! Oh… but if it is accidentally runnier than you’d like (I have made a few of these batches), just save for smoothies. Can non dairy milk be used? Thanks for posting! I just got an Instant Pot and it doesn’t give instructions for yogurt in the cookbook that came with it. Where did you find the jars that you pictured? They look perfect for yogurt. Thanks! Did you make sure it heated to 180 degrees? And did you yogurt start have live cultures in it? All other recipes I’ve read call for sanitizing the pot and any utensils that you would use, including the thermometer. So you do this? And if not, I trust you haven’t had any issues? 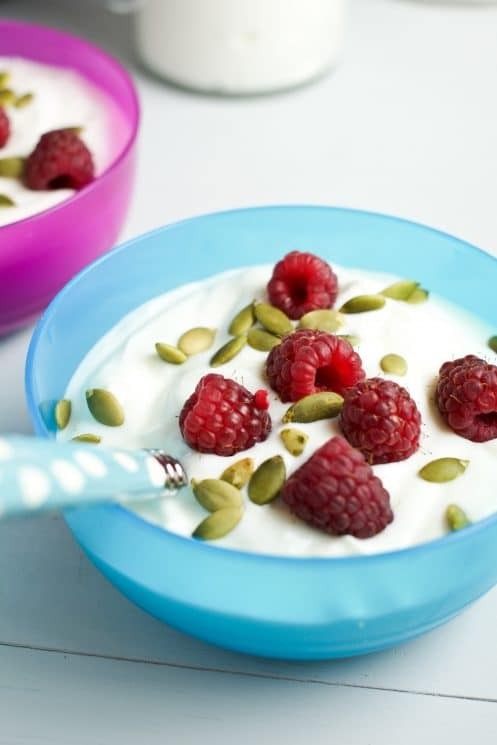 You can also make it easily with fat free yogurt. I’ve been making my own yogurt for years, the instant pot yogurt setting was a Godsend. I routinely use fat free milk, cool to 115, and incubate for 12 hours. I then strain through a nutmilk bag for 4 hours. 1 gallon generally yields 2 quarts of yogurt. I do use a metal whisk and have never noticed a metallic taste, just yummy, tangy, thick yogurt. I’m glad you posted this. I went to the store today and forgot to the Greek yogurt but have one container of fat free left! Phew. I didn’t want to travel out in the snow. Thank you! I was looking for directions for fat free. Is this like Greek yogurt or Dannon plain yogurt? Can’t wait to make some yogurt! Any recommendations for flavoring the yogurt? When would you add the vanilla in the process? I love this recipe! so much that Ive been doing it twice a week to keep up with demands. Can I double this recipe? How much vanilla and when do you add it I didn’t see it in the directions or in any of the comments? I made this recipe and the yogurt turned out very bitter and sour. Did I do something wrong? First time attempting to make yogurt. New Duo Mini. Used 1 liter of 2% and a big dollup (about 2 tbsp) of plain, active yogurt. Watched temps very carefully. Set it for 9 hours overnight. Strained through cheesecloth but almost all of it went through; almost no sign of stiffening up. How did I screw up? what is the expiration date from the date it’s made? Can I use a powdered yogurt culture in place of a prepared yogurt and what proportion of powder to milk should I use in the instant pot? What if my Instant Pot doesn’t have a yogurt button? What should I use instead? I love the little jars that you have in your photos. Where did you get those from? I just want to say that I save time and energy by boiling only half of the gallon. This brings the boiling time down to 20 minutes. Also, I don’t have to wait for it to cool down because I add the other half of the gallon after boiling and this cools it right down, so I can proceed to the next step. There is no concern about lack of pasteurization because I buy pastuerized milk. This method saves time and energy. I have tested it and it works! Can I make a gallon in a 6 quart institute pot? My Instapot doesn’t have a yogurt button. How do I get the the “boil” setting? Can you follow this same recipe with goat’s milk? How long were you able to to keep these before expiring? Does the expiration date on the starter yogurt effect the expiration date of the newly made yogurt? Yes it would affect it. I have found my yogurt will stay good for about 2-3 weeks if I store it in a glass container in my fridge. Thank you so much for your very helpful instructions! I bought my Instant Pot Duo 6 quart today and started the yogurt when I got it home. Its perfect! After the 8 hour incubation period, should the milk be hot or lukewarm? I’m afraid my 8 hour incubation period did not work. How can I tell? My second batch is incubating while I sleep. This is delicious! Thank you for showing me the way! So glad! We love this recipe. Can you make this with coconut milk or almond milk? 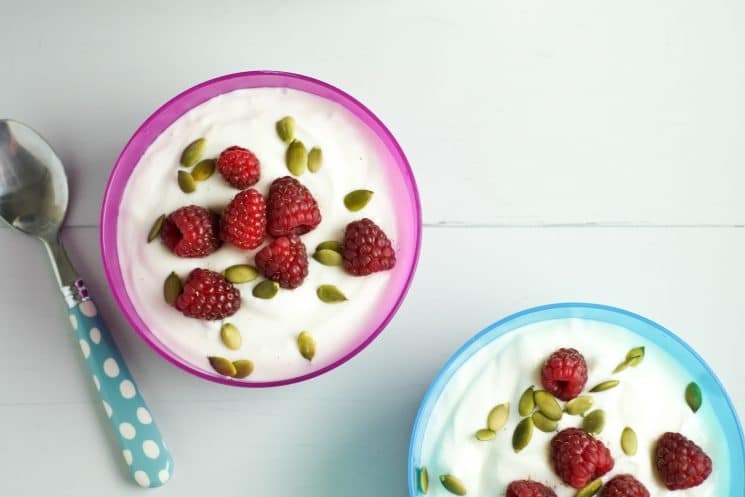 Yes you can use those alternative milks to make yogurt in the instant pot! I’m supposed to let mine yog. for 24 hours (naturopath instructed) how would I do that? Hi Lynda, you can set this yogurt to culture for 24 hours in the Instant Pot if you like. Just follow the recipe as is until you get to step 5, then set the timer for 24 hours instead of 8 hours. If you try this method, please let us know how it turns out! Hi Gail, I think it would be fine to halve this recipe. I would keep the same amount of yogurt (3 tablespoons) even with half the milk. It doesn’t matter which brand of yogurt you use, as long as the yogurt is plain, and contains live active cultures. Good luck! This worked perfectly on the first try! Thanks for the very detailed post! Glad to hear it, Jenni! Thanks for sharing. Can we use Goat milk and Goat yogurt for the starter??? Hi Ginny, I haven’t tried this with goat milk, but I’m inclined to think it would work. If you try it, please let us know how it turns out!